NOREAS has been responsible for preparation of a Feasibility Study (FS) in accordance with CERCLA and for supplemental field work at multiple sites at Marine Corps Logistics Base (MCLB) Barstow. The FS included an initial assessment of 17 sites. NOREAS determined that, of the 17 sites, 5 require remediation (determined as “actionable”). These five sites were the subject of remedial action alternative development and evaluation. The five actionable sites vary in terms of former uses and contaminants. Two of the sites have CVOCs in groundwater (one has lead shot, PAHs, and PCBs in surface soils; another has arsenic in soils, and the last site has CVOCs in soil gas and groundwater. In general, it was determined that the groundwater contaminant plumes are very dilute and are located in areas where exposure pathways and risks were not an immediate concern. 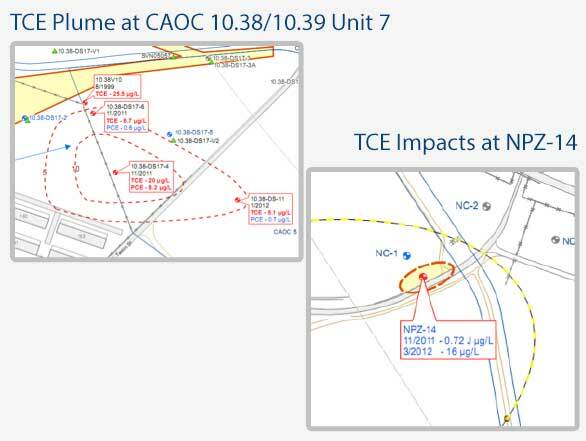 NOREAS considered a range of technologies and developed conceptual design packages for several potentially feasible alternatives (a total of 19 alternatives for all five actionable sites). The alternatives were evaluated against the CERCLA “nine criteria,” and the most appropriate alternative was recommended for each site. Technologies incorporated into selected alternatives included excavation, soil, vacuuming, MNA, and soil gas monitoring (the latter having a contingency for treatment using AS/SVE). The supplemental field work involves completion of additional field investigation at OU 7 to address current data limitations and to support further refinement of the FS.